Since their last pastor died suddenly in December 2010, Catholics at Holy Cross parish in Morris have experienced a variety of clergy: religious order priests; retired priests; priests from nearby St. Mary's parish in Oneonta who served as sacramental ministers for a while. Then Rev. Joseph Benintende, the pastor at St. Mary's, announced his retirement. When a new pastor is assigned, he'll cover Mass at Holy Cross again. Parishioners take the instability in stride. "It's been nice to have different priests," noted Maureen Joy, parish life coordinator. "You get a different homily and a different viewpoint. I found it refreshing." She said the parish's rectory is ready to house a priest again, but "not a lot of people want to be that far away from everything." Rural parishes face unique challenges in the wake of the diocesan pastoral planning process and the shrinking number of priests. Some parishes might sit 30 miles away from the next church with a priest, said Elizabeth Simcoe, diocesan chancellor for pastoral services. Also, since many retired priests live in Albany or another city, they're not always available to help - and the terrain of rural areas can mean that a 15-mile ride to church takes 45 minutes. Morris is a rural Otsego County village of about 2,500 people. When Holy Cross' mission church in Edmeston - 12 miles away - closed two years ago, most parishioners opted to go to a parish in the Syracuse Diocese rather than traveling to Holy Cross. "We lost those parishioners," Mrs. Joy said. "There's only one who comes here." Some in Mrs. Joy's deanery feel disconnected with the rest of the Diocese. The faith formation program turns to internet tools; Mass attendance is low if more than four inches of snow fall, Mrs. Joy said. Still, about 85 Catholics attend Mass on Sundays, and parishioners stepped up to help with administration and religious education after the pastor died. Deacon Frank Berning, director of the diocesan Office of Pastoral Planning, said 80 percent of the parishioners at Holy Cross are actively involved in parish life: "That's evangelization at its absolute finest, what [Mrs. Joy] is doing." Mrs. Joy's advice for other rural parishes: "Pray a lot. Then just let the Spirit lead you and He'll take you where fools fear to tread. I've learned that there's a lot of goodness in a lot of people [and] not to be afraid to ask for help." Retired priests and laypeople help fill some of the gaps at parishes in the Albany Diocese without pastors. "When people hear you're retired, you start getting phone calls," said Rev. Arthur Toole, 82, who serves as sacramental minister at St. Michael's parish in Troy and, during the summer, at Blessed Sacrament parish in Bolton Landing. He fills in elsewhere on occasion. "The nice thing about it is if we don't want to go, we don't have to," he told The Evangelist. Rev. Paul Engel, 81, is the retired pastor of Our Lady of Fatima parish in Delanson - but has continued to serve as the parish's sacramental minister since 2003. "It's nice to be needed," he said. 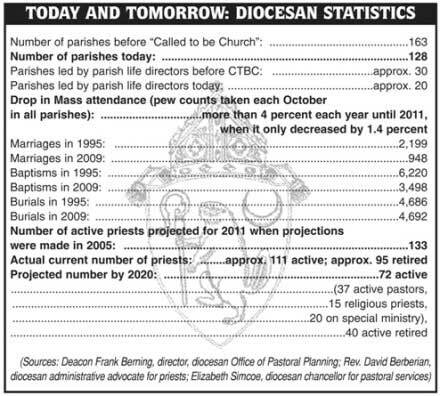 The Diocese's almost 100 retired priests are the primary source of sacramental ministers. About half regularly assist - happily, they noted. "I'm not big on golf," Father Engel remarked. "I was ordained a priest and I'm so glad that Bishop Hubbard lets us continue to minister as priests." He commended OLF's parish life director, Lynn O'Rourke, who "does all the things that priests never really were ordained to do." The U.S. bishops recently voted on standards for parish life leaders, recognizing their need in the changing Church, said Elizabeth Simcoe, diocesan chancellor for pastoral services. Enrollment in St. Bernard's School of Theology and Ministry in Albany, a graduate school from which many PLDs receive their education, is on the rise. The diocesan Kateri Institute for Lay Ministry Formation also has 50 Catholics enrolled; 986 people in the Diocese have been trained in lay ministry formation since 1984. But the need for lay leaders is not necessarily a catalyst for the growing interest, diocesan leaders said. "It's a response to our baptismal call," said Deacon Frank Berning, director of the diocesan Office of Pastoral Planning. He noted that there was no lack of priests in the 1960s, when the Second Vatican Council called laypeople to share in the ministry of Jesus and the priesthood. It's simply that "we are creating this environment where [lay]people are really being encouraged to respond." That helps busy priests, who may not have time for ministries like home visitations as they did in the past. "I see more and more laypeople doing the one-on-one visitation, but then alerting their pastors to any specific needs," said Harley McDevitt, diocesan coordinator of pastoral care. The Diocese has trained more than 200 people in pastoral care in the past three years; a record 31 signed up for classes last fall. "It's making the best use of the gifts of everyone so we can all work together for the good of the Church." The three parishes in the city of Amsterdam might soon be one...or maybe two. "Everything is up in the air," said Rev. John Medwid, pastor of St. Mary's in Amsterdam. The remaining Amsterdam parishes - St. Joseph's/St. Michael's/Our Lady of Mount Carmel, St. Mary's and St. Stanislaus - have begun their own planning process to ensure a future Catholic presence in the city. The parishes could merge or link as a result, and could be led by different priests or parish life directors. Thirty-five parishes closed or merged by the end of 2009 through Called to be Church. The remaining 128 parishes and eight mission churches continue to change: Already, for example, the Amsterdam parishes offer joint penance services, collaborate on some confirmation preparation and combine Mass schedules for Holy Days. "It's at least a way of introducing people to that concept," Father Medwid said. "I think they're kind of getting it. It isn't now that 'I can stay in my own church building my entire life and never venture out to another Catholic church.'" Even though Catholic marriages and baptisms in the Diocese fell sharply last decade, statistics suggest the national Catholic population will grow by 25 percent in the next 25 years, as it has since 1985. 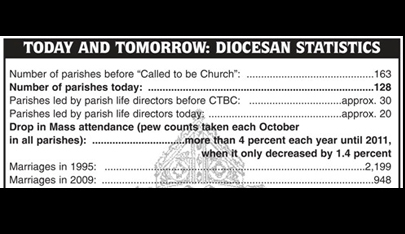 In fact, the Diocese experienced a slight upsurge in Mass attendance last year. When it began its October pew counts in 2003, attendance was dropping more than 4 percent each year until 2011, when the decrease slowed to 1.4 percent. But the Diocese is projected to have approximately 40 fewer priests by the year 2020, according to Rev. David Berberian, the new diocesan administrative advocate for priests and pastor of St. Mary's and Sacred Heart parishes in Albany. "We're not going to be able to have priests where they are now," Father Berberian said. "We have to learn to deal with less: less priests; less parishes; less money; less Masses, probably. Each individual parish needs to be looked at uniquely." Rarely does a parish have more than one priest on staff, as in past decades, said Elizabeth Simcoe, diocesan chancellor for pastoral services. About 20 parishes are currently led by women religious, deacons or lay parish life directors, supported by clergy sacramental ministers. Some pastors oversee multiple parishes. The Diocese will always ensure a priestly presence at Mass. "We are a eucharistic people," said Deacon Frank Berning, director of the diocesan Office of Pastoral Planning. "We will have Mass." But "if we want to grow, we have to change," he said. "No longer should parishes see themselves as entities unto themselves." Teamwork among adjacent parishes has become common. The 13 parishes of the Schenectady deanery, for instance, together provide pastoral care to the homebound, hospitalized and those in nursing homes. An outreach minister was recently hired to coordinate these services, as well as food pantries, social justice projects, advocacy and ministry to the Schenectady County Jail. The Local Catholic Community of St. Luke's, St. Adalbert's, St. Paul's, St. Joseph's and Our Lady of Mount Carmel parishes in Schenectady now share a faith formation director and coordinator, said Rev. Dominic Isopo, pastor of St. Luke's. By next fall, they aim to teach all 502 students in one, combined program. To the north, the Local Catholic Community of Corpus Christi parish in Round Lake, St. Mary's in Crescent and St. Edward's in Clifton Park shares confirmation retreats and other faith formation programs, said Rev. Joseph Cebula, pastor of St. Mary's. The linked parishes of St. Helen's in Niskayuna and Our Lady of Fatima in Schenectady combined youth ministries, pastoral care projects and Mass schedules after Called to be Church. They will merge completely this summer. "It was nice to have a say over our own destiny," noted Rev. Robert Longobucco, pastor of St. Helen's and sacramental minister to Our Lady of Fatima. "It's about making us a 'we' instead of 'us' and 'them.'" Father Medwid of Amsterdam affirmed that collaboration makes communities stronger: "The overall goal is to make our communities as strong and as vital as they can be. You can't just do business as usual and hope that things will get better. If we stay the way we are, it will mean that communities will die out individually. "There's still a lot of hurt out there," he added. "There's still healing that needs to be done. More changes will necessitate more healing." But that's what Catholics are all about, he said: "The whole essence of who we are is that death-resurrection pattern. Although there is a death that is occurring, there is a life that will come out of that."